In The Program Era, Mark McGurl offers a fundamental reinterpretation of postwar American fiction, asserting that it can be properly understood only in relation to the rise of mass higher education and the creative writing program. McGurl asks both how the patronage of the university has reorganized American literature and—even more important—how the increasing intimacy of writing and schooling can be brought to bear on a reading of this literature. 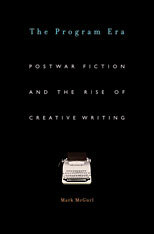 McGurl argues that far from occasioning a decline in the quality or interest of American writing, the rise of the creative writing program has instead generated a complex and evolving constellation of aesthetic problems that have been explored with energy and at times brilliance by authors ranging from Flannery O’Connor to Vladimir Nabokov, Philip Roth, Raymond Carver, Joyce Carol Oates, and Toni Morrison. Through transformative readings of these and many other writers, The Program Era becomes a meditation on systematic creativity—an idea that until recently would have seemed a contradiction in terms, but which in our time has become central to cultural production both within and beyond the university. An engaging and stylishly written examination of an era we thought we knew, The Program Era will be at the center of debates about postwar literature and culture for years to come.